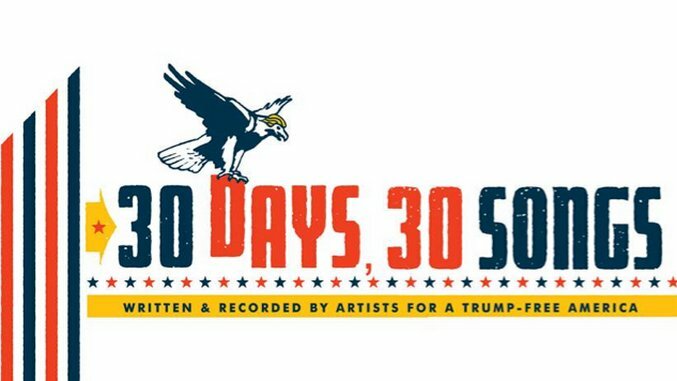 Jim James, R.E.M., Death Cab for Cutie, More Team Up for Anti-Trump Project "30 Days, 30 Songs"
The Avengers, HBO, Star Trek, and now the music industry; Donald Trump really does bring out the activistism in artists. Writer Dave Eggers has started a musical project to keep Trump from being elected president, called “30 Days, 30 Songs.” The project is a playlist of new and unheard songs from artists “united in [their] desire to speak out against the ignorant, divisive, and hateful campaign of Donald Trump.” Every day leading up to Election Day, the playlist will be updated with a new song. As of now, the known participating artists are Death Cab for Cutie, My Morning Jacket’s Jim James, R.E.M., Aimee Mann, Thao Nguyen, Bhi Bhiman and clipping., Hamilton’s Daveed Diggs’ experimental rap group. While the audience was waiting for Trump to appear, I was pretty surprised to hear music by Bruce Springsteen, Elton John and Queen. None of these musicians support Trump, of course, so it occurred to me that this election would benefit from the timely resurrection of the political protest song. From Woody Guthrie to Public Enemy, we know that songs can change minds, and particularly now, we need to motivate voters to stand against bigotry, sexism, hatred and ignorance. Lyrically, “Million Dollar Loan” deals with a particularly tone-deaf moment in Donald Trump’s ascent to the Republican nomination. While campaigning in New Hampshire last year, he attempted to cast himself as a self-made man by claiming he built his fortune with just a “small loan of a million dollars” from his father. Not only has this statement been proven to be wildly untrue, he was so flippant about it. It truly disgusted me. Donald Trump has repeatedly demonstrated that he is unworthy of the honor and responsibility of being President of the United States of America, and in no way, shape or form represents what this country truly stands for. He is beneath us. Past the first week’s lineup, it’s unknown what other artists are involved. We’d like to suggest Eggers call up The Who and Roger Waters, because they seem like they’d be on board. Prophets of Rage also strike us as a safe bet. The creators behind “30 Days, 30 Songs” make it clear they support Hillary Clinton for president, and are so determined to convince you, they have arguments to win over Bernie Sanders supporters, “feminists who can’t get behind Hillary” and other holdouts. All proceeds raised by “30 Days, 30 Songs” will be donated to the Center for Popular Democracy which is working for Universal Voter Registration, which makes it the government’s responsibility to register citizens to vote. Death Cab for Cutie’s “Million Dollar Loan” is embedded below, and new songs will go up on the playlist each morning at 9 a.m. PST. You can follow “30 Days, 30 Songs” on Spotify or on its website here.